Engine exhaust noise pollutes the street environment and ventilation fan noise enters dwellings along with fresh air. People have become conscious of their working environment. Governments of most countries have responded to popular demand with mandatory restrictions on sound emitted by automotive engines, and a thorough knowledge of acoustics of ducts and mufflers is needed for the design of efficient muffler configurations. 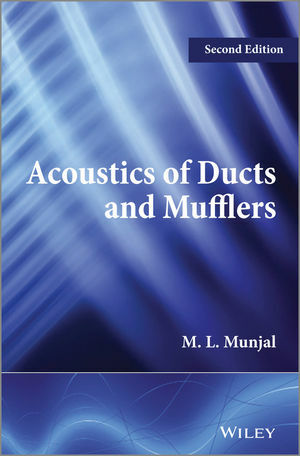 This fully updated Second Edition of Acoustics of Ducts and Mufflers deals with propagation, reflection and dissipation/absorption of sound along ducts/pipes/tubes, area discontinuities, perforated elements and absorptive linings that constitute the present-day mufflers and silencers designed to control noise of exhaust and intake systems of automotive engines, diesel-generator sets, compressors and HVAC systems. It includes equations, figures, tables, references, and solved examples and unsolved exercises with answers, so it can be used as a text book as well as a reference book. It also offers a complete presentation and analysis of the major topics in sound suppression and noise control for the analysis and design of acoustical mufflers, air conditioning and ventilation duct work. Both the fundamentals and the latest technology are discussed, with an emphasis on applications. Deals with reactive mufflers, dissipative silencers, the frequency-domain approach, and the time-domain approach. Dr. M. L. Munjal is a Mechanical Engineer specializing in Engineering Acoustics. Over a four-decade career at the Indian Institute of Science, he has published over 190 papers in refereed journals, carried out over 100 industrial consultancy projects, and has run graduate courses on ‘Industrial Noise Control’ and ‘Acoustics of Ducts and Mufflers’. He is Chairman of the National Committee for Noise Pollution Control that advises on noise control measures and legislations in India. He is also a Distinguished International Member of the Institute of Noise Control Engineering, USA, and Honorary Fellow of the International Institute of Acoustics and Vibration. He has been a member of the Editorial Board of several journals including the International Journal of Acoustics and Vibration.